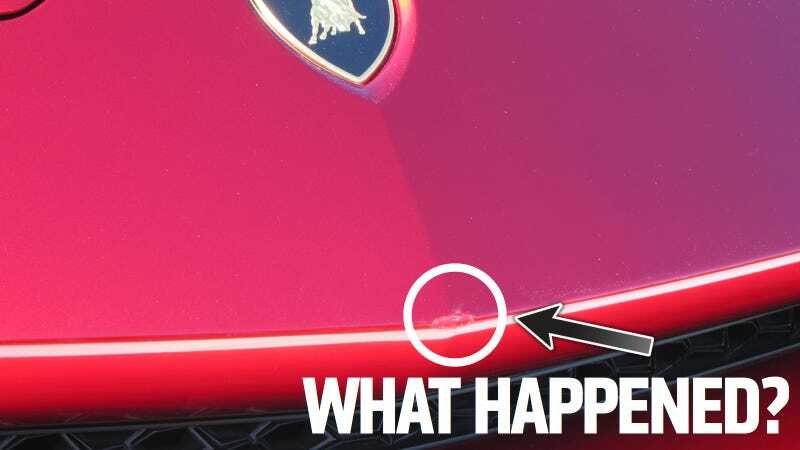 Who Damaged The Lamborghini SUV? The Lamborghini Urus SUV Concept made its debut earlier this year in Shanghai and is still making the rounds on the auto show circuit. This weekend, the car was in Monterey, California for The Quail and on the concept lawn at Pebble. It looks spectacular in person, but there is an issue. Someone has damaged the nose of the car. Now, it isn't earth shattering, terrible, disfiguring damage, but there is an obvious chip in the clear coat of the nose. 1 - It was slightly damaged when it was moved from show to show. 2 - Ferruccio Lamborghini saw the car from heaven, decided it was heresy against the brand, and smited the tip of the nose as a hint to Audi that the Urus shouldn't be built. I conducted a seance and I can confirm that while Ferruccio is upset about the Urus, he did not damage the nose of the car. He also said that he still hates Enzo Ferrari.